Cary North Carolina Magician appears in Cary NC. Magician Cary North Carolina and Balloon twisting and face painting. Enjoy great food and entertainment at Family Night at the Cary Golden Corral the first Tuesday of every month in 2012. Appearing at the Golden Corral in Cary for Family Night is Magic by David. Magic by David is a Raleigh Magician that performs throughout North Carolina. Magic by David has 10+ years experience entertaining. David will amaze and delight all ages with table side magic during Family Night at Golden Corral. Kids will also be able to enjoy balloon twisting – creating anything you can imagine from dogs and bunnies to pirate swords and ray guns. Kids may also get face painted! 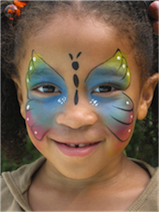 From small designs to full face painting – kids of all ages will enjoy face painting. When you visit Golden Corral Cary for Family Night you get all this entertainment plus great food! Parents can enjoy Family Night at the Cary Golden Corral located at 5707 Dillard Dr, Cary. Family night is each Tuesday from 4pm – 9pm, Magic by David performs the first Tuesday of each month. All kids age 4-12 can enjoy a delicious meal for just $1.99 (2 kids per adult meal purchased). Everyone deserves a good meal and that’s why Golden Corral uses fresh wholesome ingredients in their made from scratch recipes. Cary Face Painter – Magic by David – now at Golden Corral.